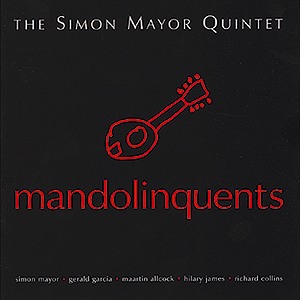 The Simon Mayor Quintet are SM, Gerald Garcia, Richard Collins, Hilary James, and Maartin Allcock. This debut album features everything from hot swing and ragtime instrumentals from the mandolin orchestras of the 1930s to Irving Berlin, Mozart, Ravel, Tchaikovsky, Irish airs and Chinese and Brazilian folk tunes. All this played with infectious fun, off-beat humour and stunning virtuosity on mandolin, mandola, mandocello, mandobass and classical guitar, with the occasional burst of song or fiddle.